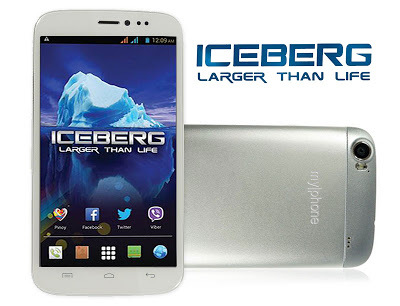 MyPhone will release a new flagship device off its line on July 26, called the MyPhone ICEBERG. For whatever reason, this phablet is also called the "BLU Life View" and if it's the Philippine logo that's holding you off in buying a MyPhone, then this could be your puppy. Ahead of its launching, MyPhone revealed the specs on its Facebook page. The phablet will go neck-and-neck with the Starmobile's Diamond V series with its Gorilla Glass-treated 5.7-inch display. All aboard the bandwagon is the 1.2 GHz quad-core processor, 16GB of internal storage, 12 megapixel rear shooter with BSI and a gigabyte of RAM. Aside from the full-packed hardware, its software is also tweaked with loads of features like Clever Motion which seems to be an air-gesture feature, TV out Wireless Display and TARA (Theft Apprehension and Asset Recovery Application). 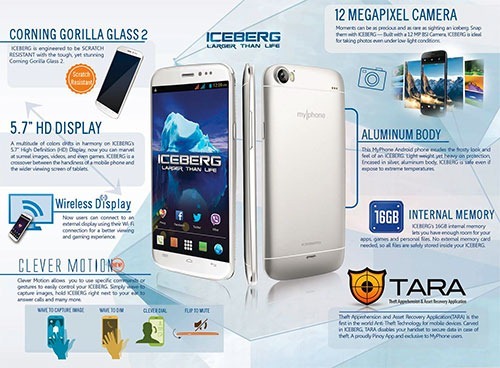 The MyPhone ICEBERG is hefty priced at Php 11,988 starting July 26. MyPhone is also offering the phablet in installment basis for as low as Php 499.50 per month up to 24 months with participating partner banks.